Chapter 6 isn’t something that I actually planned to write. 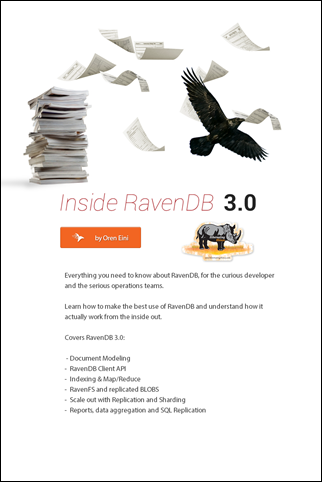 I thought that I would be writing a high level guide into how to use and utilize RavenDB indexes. What came out was a detailed discussion on the actual RavenDB indexing process, including a deep look into the kind of environment that we have to deal with, the type of design decisions that we had to make and the balancing act between competing demands. I don’t know if anyone would be interested in actually reading it, since it is quite low level, and it wasn’t a lot of fun to write. It is really hard to summarize six years of operational experience into a few words. It is even harder to show you the final result and discussing that without the full history of “we tried this, and that, and that as well”. But I think it ended up okay. You can get it in the following URL. I mentioned that we are looking for more people to work for us. This time, we are looking for WPF people for working on the profiler, as well another hush hush project that we’ll hopefully be able to reveal in December. Because we are now looking for mostly UI people, that gives us a different set of challenges to deal with. How do I get a good candidate when my own WPF knowledge is limited to “Um.. dependency properties, man, that the bomb, man, yeah!”. Add that to the fact that by the time people got an interview here, we want to be sure that they can code, that present an interesting problem. So we come up with questions like this one. Another question we have is the large text viewer. We need a tool that can work with text file (logs) of huge size (1GB – 10 GB). We want to be able to open and search through such a file. Nitpicker corner: I usually use this tool for that, the purpose of the question isn’t to actually to get such a tool, it is to see what kind of code the candidate writes. We are looking for someone with a lot of skill in the UI side of things, so the large text file stuff is somewhat of a red herring, except that we want to see what they can do beyond just slap a few text boxes around. Well, I just committed the last feature for RavenDB 3.0, and all the tests are passing. What we are doing now is just working through the studio and running verification tests. Tomorrow or Sunday we are going to go live on our own systems with RavenDB 3.0. And shortly after that we’ll do an release candidate, followed by the actual release. We are still in a hiring mode. And today we have completed a new question for the candidates. The task itself is pretty simple, create a form for logging in or creating a new user. The catch here is that we provide that as a dll that include the implementation for this, and as this is supposed to represent a 3rd party service, we made it behave like that. Sometimes the service will take a long time to run. Sometimes it will throw an error (ThisIsTuesdayException), sometime it will take a long time to run and throw an error, etc. Now, the question is, what is it that I’m looking to learn from the candidate’s code? Development and testing – in this day and age, people are connected to the internet through most of their day to day life. That doesn’t mean that they are always connected, or that you can actually rely on the network, or that the latency is acceptable. There is no current development story for ADB. No way to run your own database and develop while you are offline (on the train or at 30,000 feet in the air). That means that every call to ADB has to go over the internet, and that means, in turn, that there is no local development story at all. It means a lot more waiting from the point of view of the developer (also see next point), it means that there is just no testing story. OneNote’s server side is apparently one such use case, but from the look of things, I would expect that this is the other way around. That ADB is actually the backend of OneNote that Microsoft has decided to make public (like Dynamo’s in Amazon’s case). I’ve been working for a while on seeing where we can improve RavenDB, and one of the things that I wanted to address is having an authoritative source to teach people about RavenDB. Not just documentation, those are very good for reference, but not so good to give you a guided tour and actually impart knowledge. That is what I wanted to do, to take the last five years or so of working on and with RavenDB and distill them. The result is about a hundred pages or so (and likely to be three or four hundred pages). In other words, I slipped up and started churning out a book . You can download the alpha version using the following link (which will be valid for the next two weeks). I want to emphasis that this is absolutely unedited, and there are likely to be error for zpelling in grammar*. Those will be fixed down the line, currently I’m mostly focused on getting the content out. Here is also the temporary cover. Comments are welcome. And yes, this will be an actual book, in the end, which you can hold in your hand and hopefully beat someone over the head if they need to smarten up. * The errors in that particular sentence were intentional. It is a good day, so I decided to share some joy. This offer will be valid for 24 hours only. In my interview questions, I give candidates a list of 6 questions. They can either solve 3 questions from 1 to 5, or they can solve question 6. Stop for a moment and ponder that. What do you assume that relative complexity of those questions? Questions 1 –5 should take anything between 10 – 15 minutes to an hour & a half, max. Question 6 took me about 8 hours to do, although that included some blogging time about it. Question 6 require that you’ll create an index for a 15 TB CSV file, and allow efficient searching on it. While questions 1 – 5 are basically gate keeper questions. If you answer them correctly, we’ve a high view of you and you get an interview, answering question 6 correctly pretty much say that we past the “do we want you?” and into the “how do we get you?”. But people don’t answer question 6 correctly. In fact, by this time, if you answer question 6, you have pretty much ruled yourself out, because you are going to show that you don’t understand something pretty fundamental. Here are a couple of examples from the current crop of candidates. Remember, we are talking about a 15 TB CSV file here, containing about 400 billion records. Plus side, this doesn’t load the entire data set to memory, and you can sort of do quick searches. Of course, this does generate 400 billion files, and takes more than 100% as much space as the original file. Also, on NTFS, you have a max of 4 billion files per volume, and other FS has similar limitations. So that isn’t going to work, but at least he had some idea about what is going on. So take the 15 TB file, load it all to memory (fail #1), convert all 400 billion records to entity instances (fail #2), write it back as xml (fail #3,#4,#5). Read the entire (greater than) 15 TB XML file to memory (fail #6), try to do a parallel brute force search on a dataset of 400 billion records (fail #7 – #400,000,000,000). So, dear candidates 1 & 2, thank you for making it easy to say, thanks, but no thanks.